Main concept of the movie is inspired by the hit novels by J.K. Rowling and its screen play Harry Potter. The hero is a child who has lost his father who was a magician. Now he wants to learn magic from the magic school called Aabra-Ka-Dabra on the outskirts of the city in thick forest. Even the introduction of the school Aabra-Ka-Dabra looks a lot like the introduction of Hogwart. Also the starting of the movie is same as of Amitabh's Jadugar where his father dies while performing magic show and then he resolves to complete the show when he grows up. Shanu's father dies while performing magic show, after which life becomes miserable for him as well as for his mother. His mother earns money by doing household chores and Shanu himself finds a job at a Dhaba. Life is difficult for both, but Shanu manages to get a sponsor to learn magic and fulfil dream of his father. 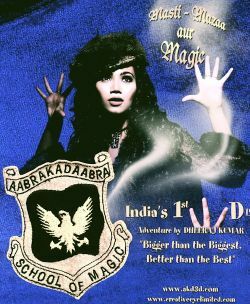 Shanu reaches the magic school, 'Aabra Ka Dabra', located at outskirts of the city and in dense woods. He meets the principal of the school Ms. Rang Birangi. She is the woman who creates fears among school kids in their dreams. Shanu makes many friends and enemies too. One day he discovers a hidden truth about Ms. Rang Birangi. His world changes after that and so also the lives of his friend and foes too. The real magic of 'Aabra Ka Dabra' now starts unfolding and Shanu's eyes see the sparkle of success after a long wait.